Greenline is all about the ENVIRONMENT. We want to keep our most beautiful boating spots in the same pristine condition as when we first discovered them. We want to enjoy the untouched beauties of the boating world for years to come and pass them on to our children and grandchildren. The Greenline 33 and Greenline 40 are a powerful answer to this concern as it uses up to four times less fossil fuel in a year than a planing powerboat, and is completely emission-free in electric mode. 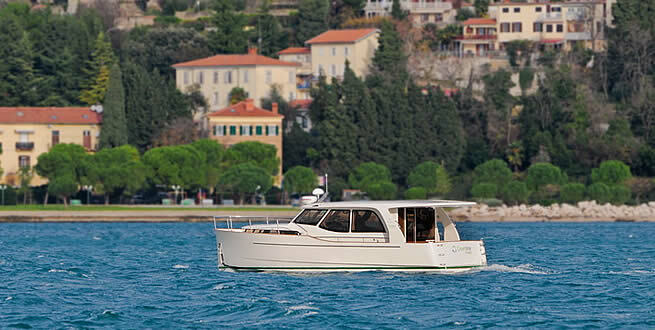 The hybrid (diesel-electric) and solar powered drive systems have proven themselves both reliable and cost effective – giving birth to the Greenline Range with the Greenline 33, the world’s first production hybrid and solar powered boat. Greenline is ALL about EFFICIENCY. In the modern age, efficiency is all important. Efficiency in how we use energy (especially energy derived from fossil fuels), important natural resources and our financial assets. That is why we invented the protected Superdisplacement low-drag hull, which, although it is not capable of attaining fast planing speeds, uses much less energy to move through the water at speeds of up to 15 knots. Not only does this innovation reduce fuel consumption, it also allows efficient electric propulsion using power supplied by the battery and solar power. 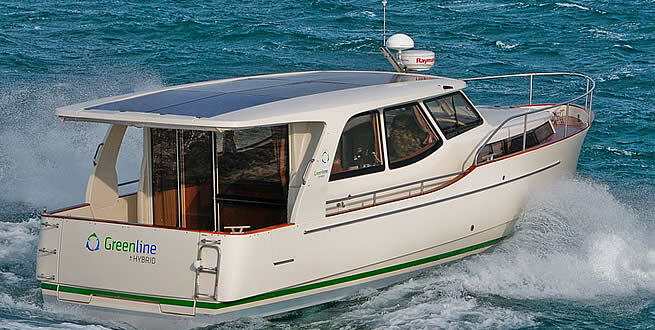 Designed and built by people who know more about volume boat manufacture than anybody else in the world, the Greenline 33 is more cost-effective to buy and use than any comparable boat, thereby offering incredible value for money. Greenline is ALL about YOU. Maximising your well-being on board and your enjoyment during a relaxing cruise were our main objectives when designing and building this yacht. We appreciate and share your passion for boating. 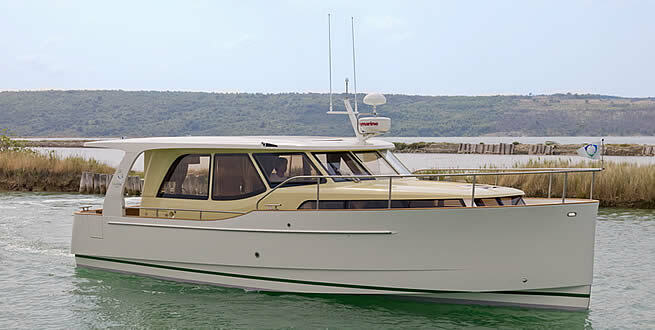 Not only does the Greenline 33 deliver more comfort, greater ease of handling and more fun than any other boat, this outstanding design adds a new dimension. 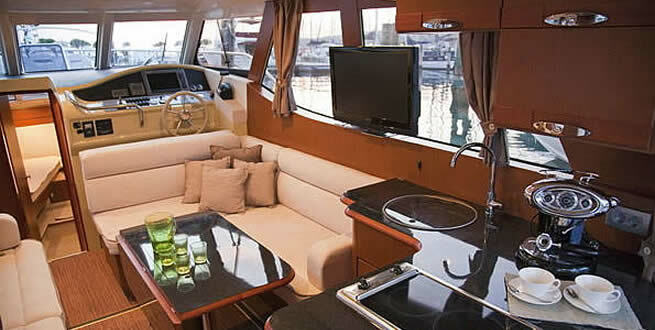 It allows you to savour the quietness of the water as you would on a sailing yacht without polluting your surroundings or the environment with smoke, noise or waves. The Greenline 33 will take you to any of your favourite cruising haunts in Europe - regardless of whether they are inland waterways, lakes, inshore waters or offshore islands - in comfort and safety. Through an enormous effort in time and money spent in the development phase of the Greenline hybrid, this state-of-the-art product offers great performance, reliability and user friendliness at an incredible value for money. Unlike today’s modern cars which still need to burn fuel to produce electricity, the Greenline Hybrid Solar is capable of collecting, storing and using power from the sun, which is a breakthrough in hybrid marine technology. With a 1.3 kW solar roof and the Hybrid drive (5kW generator/7kW electric motor integrated in one unit), the Greenline Hybrid Solar is a mobile power station that provides a constant supply of electric power on board. In spite of its revolutionary design, the technology used in the Greenline Hybrid Solar is not at all complicated. All the systems are electronically controlled, automatically charging the battery when there is an adequate supply of daylight or when the diesel engine is running. a single switch that lets you choose between two drive modes: diesel or electric. a modern 5-cylinder marine diesel engine made by Volkswagen. a fully electronically managed and maintenance-free electric motor/generator (eM/G). These two components are integrated into one unit, thereby saving space and weight. The eM/G is coupled to a ZF gearbox, which drives the propeller. A 3 kW inverter/charger that charges the battery in the shore power mode and delivers a 230 V AC power supply throughout the boat at all times. The GreenPad aids you in voyage planning, boat moni­toring, management and handling, navigation, communication and en­tertainment for your whole family on board. 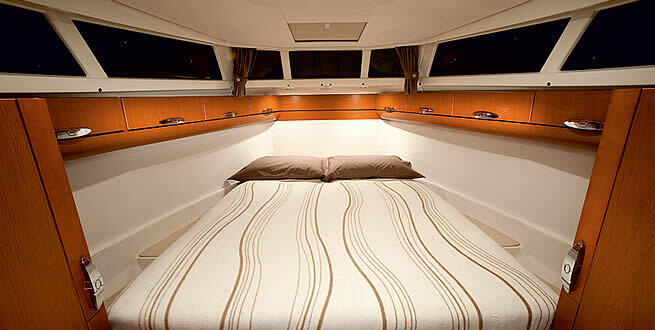 The GreenPad is an iPad application that has been specially developed for the Greenline range of yachts. Wirelessly collecting data from the Green­Box in the engine room, it graphically shows the status of your Greenline on the iPad. 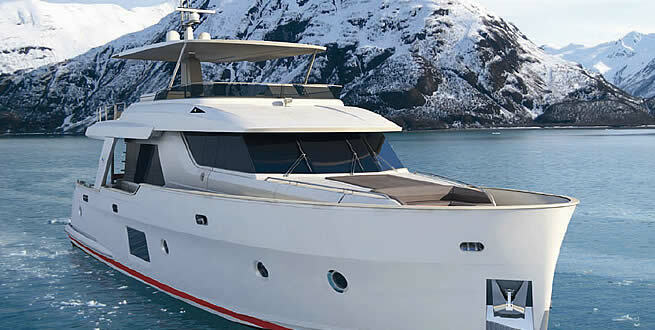 All the boat data is presented through a user-friendly inter­face. It is packed with features, easy to use and comes with a customiz­able interface: just slide to set the detail level of your choice. From a clean & intuitive 3D graphic view to a detailed list of all your boat’s functions. Drag the fields to where you want them, turn them off or just snap them back into place. You can zoom in anywhere or double tap the speedom­eter to view it full-screen. When you’re satisfied with the looks, just tap to disable touch functionality, and with the app changing modes automati­cally, you will always see what you need without having to tap a button. Besides being efficient, the Superdisplacement hull shows optimum performance in all sea conditions - an important factor in comfort and safety when underway. 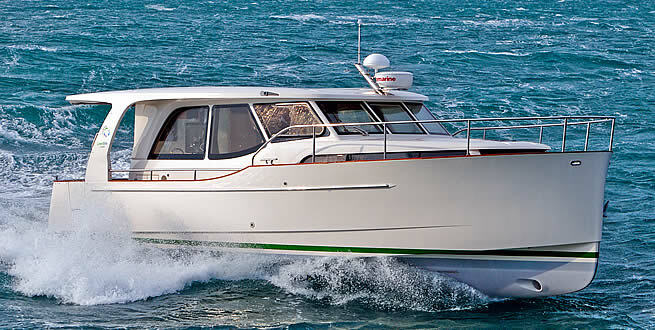 The Greenline 33 manages any kind of sea situation with ease, needing only minute corrections at the wheel. The twin sacrificial stabilisers are a further advantage of this hull, and have three functions: they deliver roll stability, tracking stability, and protect the drive and rudder. If the stabilisers get damaged, the structure of the boat will not be affected. The fins can be quickly and inexpensively replaced. The design of the Greenline range completely redefines user-friendliness, changing the way you will spend your leisure time at sea. 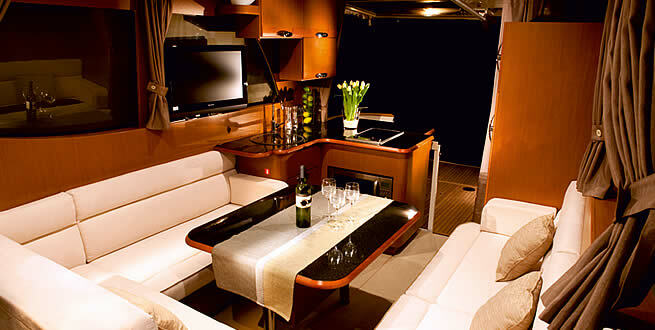 A flexible interiors, excellent visibility, high levels of ambient light and room to move around in comfort. Comparison of fuel consumption in litres and CO2 emission in kg per boating season (35 boating days): a 33-feet sailboat with a diesel engine versus Greenline 33 Hybrid versus a 33-feet twin diesel engine powerboat.